As we consider AAA in the 20th Century, we look to Esphyr Slobodkina to deepen the story. “When, finally, in 1936, the Museum of Modern Art did offer its public an exhibition of cubist and abstract art, only European artists were included. The abstract artists did exist in America, but the contact with [their] public was all but entirely denied [them]. In the catalog American Abstract Artists, 1936-1986: 50th Anniversary Celebration, a chronology compiled by Philip Verre and Ward Jackson, with assistance from Leo Rabkin, Irene Rousseau, Merrill Wagner and Slobodkina, we learn the salient aspects of the group’s history. In January 1936 preliminary discussion took place to consider establishing a group of abstract artists, and meetings would continue throughout the year. On January 8, 1937, the group decided to call itself the American Abstract Artists. The group’s first exhibition took place in April of that year. There would be annual exhibitions, some traveling, at commercial galleries, academic galleries, and museums for the next 50 years—as well as talks and panel discussions—a tradition that continues today. “Burgoyne Diller, who at the time  was [Project Supervisor] of the WPA Mural Division in New York [City] became the group’s leader and was able to employ a number of these modernists in his program. A.E. Gallatin was an early ardent supporter of American modernists. 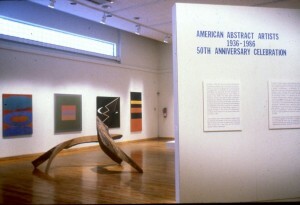 At his Gallery of Living Art at New York University he exhibited many of AAA’s works, wrote about them and contributed to their cause. Other founding members included Josef Albers, Ilya Bolotowsky, Balcomb Greene, Gertrude Greene, Alice Trumbull Mason, Ray Kaiser (later Eames), George McNeill and Vaclav Vylacil, a total of 39 artists, most based in New York City. In subsequent years they would be joined by such artists as Alice Adams, Richard Anuskiewicz, Will Barnet, Perle Fine, Suzy Frelinghhuysen, Marcia Hafif, Ward Jackson, Vincent Longo, Judith Murray, Lucio Pozzi, Dorothea Rockburne, Judith Rothschild, and Merrill Wagner. Jackson noted that even before Mondrian’s arrival, which was facilitated by AAA member Harry Holtzman, the painter had “had an impact on members.” And yet AAA would in turn have an impact on American abstraction. – Judy Collischan Van Wagner in the catalog essay for the group’s 50th anniversary.